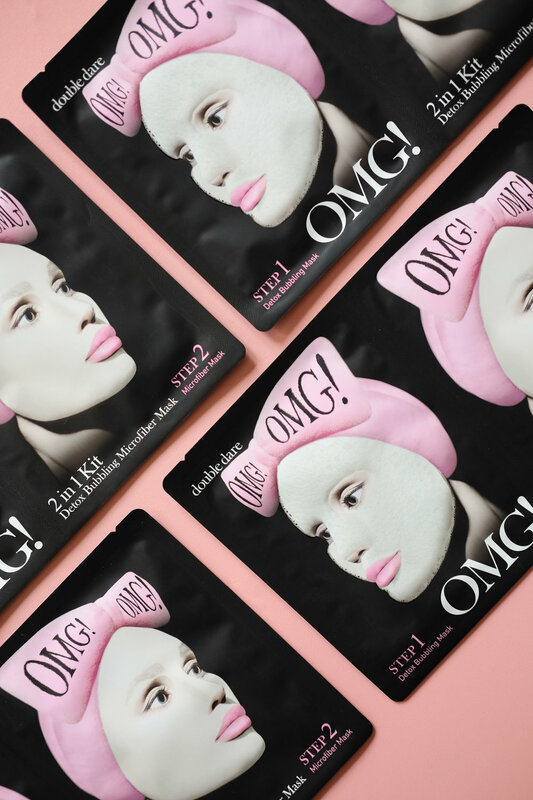 Double Dare, a brand originated from Los Angeles, California offering a range of hassle-free home facial spa masks are now available in Malaysia at all Beauty & Co facial parlors and its official online store. Debuting in Malaysia for its first launch are 5 highly-anticipated products from the OMG! Mask Collection and Age Freeze range which includes the brand’s best seller OMG! 2-in-1 Kit Detox Bubbling Microfibre Mask which is a 2-in-1 cleansing and facial mask for effective deep cleansing and moisturising effect. It also features the Age Freeze Gel Mask, supercharged with 5 extraordinary Oriental Plants – Jeju Cactus, Tiger Centella, Gold Root, Tiger Root and Green Tea, the Gel Mask acts to freeze the aging process and provides instant skin lifting and firmer skin. said Ms. Yann Fang Yap, CEO of Beautypedia Sdn. Bhd. Founded in January 2017 by beauty industry veterans with 20 years of experience, Double Dare pushes the boundaries of beauty and skincare to ensure that its products are unique and innovative in the industry. The products are designed to deliver effective results in the simplest manner and strives to nourish the adventurous spirit and fuel the passion of its users as they go on a wanderlust journey to indulge and discover easy, hassle-free masking experience. Let Edition KLFW give you the inside scoop on balancing your busy schedule and beauty needs with these easy to use products, what they are; and how they can be incorporated into your own skincare routine. The OMG! 2-in-1 Kit Detox Bubbling Microfibre Mask is an effective deep cleansing skincare product. It consists of 2 masks for an effective cleansing routine. Exfoliate dead skin cells and eliminate build-up of impurities using the OMG! Peeling Gel. Made with ingredients such as Papaya Fruit Acid, Lemon Fruit Extract, and Vitamin C & E, this peeling gel exfoliates and tighten pores while brightening and keeping the skin hydrated. Hyaluronic acid contained in this peeling gel also helps to replenish moisture, revealing a smooth and radiant complexion. The OMG! Pulling Gel contains ingredients such as Papaya Fruit Enzymes, AHA, Jojoba Seed Oil and Hyaluronic Acid to gently pull away blackheads, exfoliate and dissolve dead skin cells. The unique gel formula emits a warm sensation on the skin to open up pores, while the Strawberry Seeds work to remove blackheads and dead skin cells. AHA acid melts away debris and pores are left visibly reduced for smoother looking skin. Achieve youthful looking skin with the Age Freeze Gel Mask. This mask is supercharged with 5 extraordinary Oriental Plants – Jeju Cactus, Tiger Centella, Gold Root, Tiger Root and Green Tea to freeze the aging process and instantly lifts and firms the skin. The luxurious gel mask with powerful botanicals promotes anti-aging, antiwrinkle, brightening and detoxification of the skin. The Age Freeze Gel Mask will smooth, soften and improve the skin tone by reducing the signs of aging, including fine lines and wrinkles. Achieve smoother, radiant and more youthful-looking skin in no time! The Age Freeze Veil Mask moisturizes, restores elasticity and helps reduce the appearance of fine lines and wrinkles. This innovative mask works to seal in moisture deep within layers of the skin using ingredients such as Ceramide and Hyaluronic Acid to encourage collagen production to maintain a plump and supple look. Beta-Glucan and Trehalose promotes skin healing for a brighter, firmer, and more even skin tone. Forget the Korean 10 step skin care routine and save all the hassle and time to travel to a facial salon as you can now experience your very own personal home facial spa experience with Double Dare masks. To achieve maximum results for healthy, brighter and glowing skin, use the Double Dare masks following the sequence below. Double Dare masks are now available in all Beauty & Co outlets – Bukit Tinggi (Klang), Kepong, 1 Utama Shopping Mall, USJ Taipan, Setia Alam, Paradigm Mall, Cheras & The Gardens Mall as well as its official online store – Double Dare Malaysia. Anything this fun, sassy and adventurous is definitely worth checking out! And if you are anything like us, we get giddy about trying new things and pushing the boundaries of beauty and skincare. What are you guys waiting for?